What did you first think of when I said Sprinkles? I’m guessing you thought of the colorful little do-da’s that go on top of your favorite cupcakes and cookies! Well as much as we love our sweets around here, we have some calorie free Sprinkles to share with you today! They are woven labels AND size tags for all of your handmade sweets & treats!!! 30 amazingly cute labels and size tags. Can you tell me a little about how ya’ll got started? How did the name Izzy & Ivy come to be? make and most importantly, fun to wear! I’m giving away 1 free SPRINKLES CUPCAKE!! I will randomly select a winner next Monday. PS- Don’t forget to LIKE us on Facebook for all the newest notions, fun & giveaways. 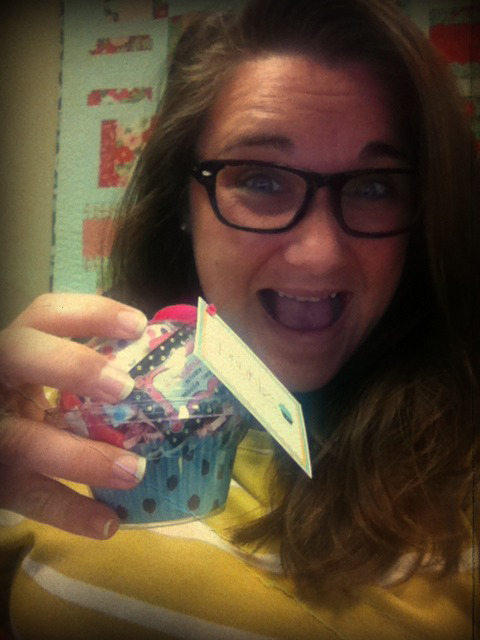 Next Next post: Sprinkles Winner! I have a great sewing buddy that always gives me sweet feelings. If I win this, I am giving it to her. Circa 1934 by Cosmo Cricket is giving me a sweet tooth! I am in love with Ruby and the multi-stripe prints in the American Jane Fairy Tale Friends line….they are perfect for backings and stash basics. Rulers…all the fun specialty rulers on the market…way fun to play with! THESE labels are giving me a sweet tooth! Ok I think I just fell in love with sprinkles. I am having a thing with terrain right now. Just love a sprinkle or two! I’m having some fun and getting ideas with the fabric ‘Ruby’. All of the Moda fabric lines make me drool! Love these sprinkles too! I am loving the beautiful trims by French General – wish I could have them all! I have fallen in love with the Dragonfly line from Moda. Not sure who the designer is but I went in to get some blue to frame a cross stitch project in and came out 3 yards of fabric and a desire to learn to quilt. Moda Bliss is giving me a sweet tooth, but I also love sunkissed by sweetwater. Love the dragonfly range too! And Sprinkles is pretty lovely too! I’m loving Sherbert Pips at the moment and I can’t wait for Little Apples to arrive in the UK! Would love to get a “Sweet Tooth” with this giveaway. Thanks for the chance. Oh, those are so great! I’m having a sweet tooth for Heirloom by Joel Dewberry right now. Oh and Going Coastal by Crazy Old Ladies. I am loving the Ruby collection that’s coming soon! So much fun! I am loving the Hometown by Sweetwater collection. Can’t wait for yardages to be available! These Sprinkles are just so cute! And the packaging is just the “icing on the cake”! Thanks for the giveaway! What a cute idea! Hope I win! I am craving terrain right now. Can’t wait to get back to the states to pick up my fabric orders.I see at least one quilt and quite a few things for the GD and GS. I have yet to see a bolt of fabric that doesn’t give me a sweet tooth. Love anything by Moda! Joel Dewberry’s new line, Heirloom, has my sweet tooth in an uproar! Anything orange: ribbons, buttons, fabric. Love the Sprinkles!! I’m lovin’ the splish splash fabric line!! The sprinkles would be a wonderful addition!! I love this fabric from Michael Miller fabrics…. Far Out Floral in gray. I want to use this as a jumping off fabric to redo my bedroom. It’s happy but soothing in gray! I’m loving all of Basic Grey’s accessories! I’ve fallen in love with It’s a Hoot and have 3 charm packs to help satisfy my sweet tooth! And I love labels! Michael Millers It’s a boy thing is giving me a sweet tooth. I love any type of embellishments and “Sprinkles” will fit in my sewing room really well. What a creative idea! Love it!! Love these! Little Apples is giving me a sweet tooth! Sarah Jane’s “Children at Play”! I just love it! If anything is making me feel sweet right now, it’s that lovely fabric line. Hurray for cute labels! Those would be fabulous on our handmade items. I need to get some! I am just finishing up a batch of Christmas stockings with my first real applique work-discovered I like it. Just ordered some Valori Wells patterns & these would work great on those (clothing patterns). I love the sprinkles! What a great idea. Sweetwater gives me a sweet tooth! Sprinkles are a very good idea! Alphabet Soup by Riley Blake! Sooo cute! The sprinkles are so unique! Anything Riley Blake gives me a sweet tooth! Lovely labels, just perfect for sewing! I was just searching on the United Notions website and I found a pattern for a Sweet Treat Bag. I thought it would be such a great idea for putting in treats for my 15 month old daughter. So now I totally have a “Sweet Tooth” to make it!! My sweet tooth got going with Ruby and Strawberry Fields. Then I checked out your futures and saw a fabric line coming out in December by Urban Chiks. I’m so excited I could swoon! I am a follower and currently I can not get enough of Kaffe Fassett to satisfy my fabric craving. Strawberry Fields by Fig Tree is giving me a sweet tooth! 🙂 BTW, these labels are sweet!!! What an adorable idea. They are giving me a sweet tooth. What “Sweet Labels” gotta have some especially in a cupcake. have just signed in to be a blog folower! the labels are really sweet! the labels i bothered to add to my work werenot fquite the thing. i’d be proud to sew these on my quilts! ToYo makers are something I want to try and these are also giving me a sweet tooth! I am always on the lookout for great labels. All those gorgeous tags are giving me a sweet tooth! Who knew such treats even existed? Lovin’ the cupcake. I have some of the Sherbert Pips that is giving me a sweet tooth. Thanks for introducing me to Izzy & Ivy and for the giveaway. Hometown by Sweetwater is lookin’ pretty sweet! Sooo pretty! Can’t wait to satisfy my sweet tooth with some fantastic Terrain! !